From the previous modules, point out the materials on the table. 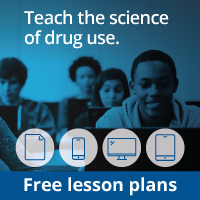 Briefly discuss the high points of each module, which include: the parts of the brain, neurotransmission, the difference between helpful and harmful drugs, and what tobacco does to the body. Tell the students that they are going to draw some conclusions about what they have learned during the Brain Power! program and to apply that knowledge to substances they did not study. Ask students if they remember what the first step is in scientific inquiry. Help the class remember that the first step is to observe and describe these materials. After the class shares its ideas, tell students to get into groups of three. Have each group develop conclusions based on all they have learned during the program. Then have each student record his or her group’s conclusions on the log sheet. For example, one possible conclusion may be: “It is important to take care of your brain by not putting unnecessary drugs into your body.” Each group’s conclusion should emphasize the importance of not taking any substance that could harm the way the brain and the nervous system work. Have each group use the information in the previous modules to explain whey they shouldn’t put unnecessary drugs into their body. Now give students an opportunity to apply what they learned to two new substances. Give half the groups the fact sheets about cocaine and alcohol and half the groups the fact sheets about marijuana and nicotine. Tell students that their mission is to determine how these drugs affect the brain and the nervous system. Then students will have an opportunity to present their ideas to the class. Their presentations can use the model of the brain, the neurotransmission simulation game, or the riddles. They also can develop a skit, make a poster, write a comic strip, or develop their own unique presentation. CONGRATULATIONS! YOUR STUDENTS HAVE JUST COMPLETED THE LAST MODULE IN THE BRAIN POWER! PROGRAM. When your class has completed the Brain Power! program, place the reverse sides of all six posters together to create the certificate of completion. The students can all sign their names to indicate that they are now NIDA Jr. Scientists! Have each group give its presentation. After the presentations, discuss how cocaine, marijuana, alcohol, and nicotine affect the brain and the nervous system. Have each student summarize what he or she learned during the Brain Power! program. Ask each student to read his or her summary to the class. Ask students to think of one thing they would tell their friends and family about the program. Suggest that they make a poster of their one thought and share it with their families.